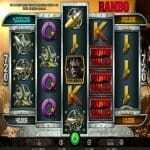 Rambo by iSoftBet is one of the newest slot machines by the developer. 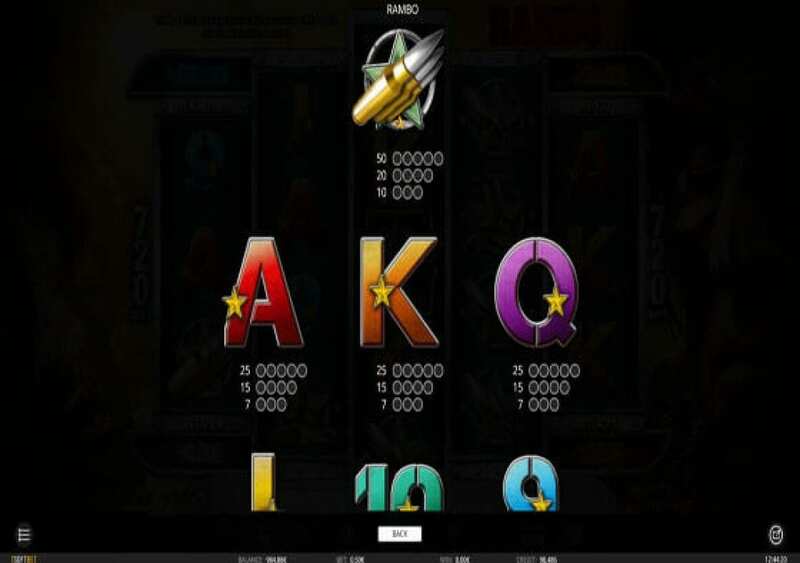 The online slot machine revolves around the action movie franchise, the big Hollywood blockbuster, the Rambo Franchise. It is one of the iconic movies in the history of action films, and the portfolio of Sylvester Stallone. Rambo has five reels with 720 ways to win and a varying number of symbols on each reel. Rambo does not only offer you an action-packed experience, as it is a highly rewarding one as well. The online machine has a free spins round, wilds, and progressive jackpot prizes. Play Rambo here for free, and check out its winning potential and fun experience before you play it for real. 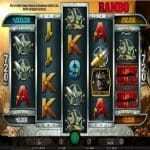 Rambo is a five-reel video slot machine that has 720 ways to win. It offers you an action theme that revolves around Rambo, the popular movie franchise. 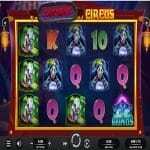 It has progressive jackpots, free spins, wild icons, expanding symbols and more. It also has an action-packed ride with immersive visuals. So get ready to join Rambo in the Vietnamese jungle for a one-of-a-kind adventure by iSoftBet. 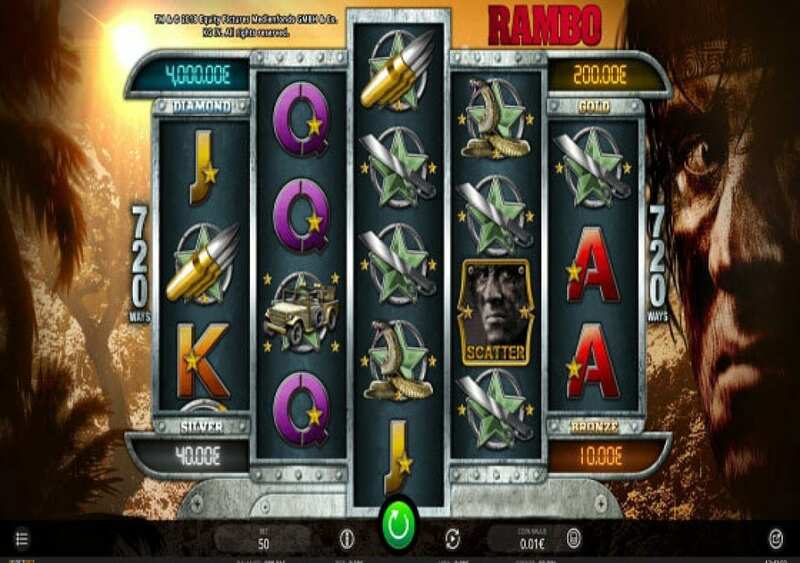 Rambo is an iSoftBet powered video slot, and it revolves around one of the most famous action movies of all time, the classic Sylvester Stallone movie, Rambo. You are going to join Rambo in Vietnam for an action-packed adventure that is full of rewards, bonuses, and jackpots. Rambo has great visuals that will immerse you into the theme of the slot for a great experience. Rambo is playable here for free, so you can see all that it has to offer you before you place any real stakes on the slot machine. It is also playable across a multitude of devices including iOS devices, Androids, Windows and more. It is also compatible with small-screened phones, tablets, and laptops. 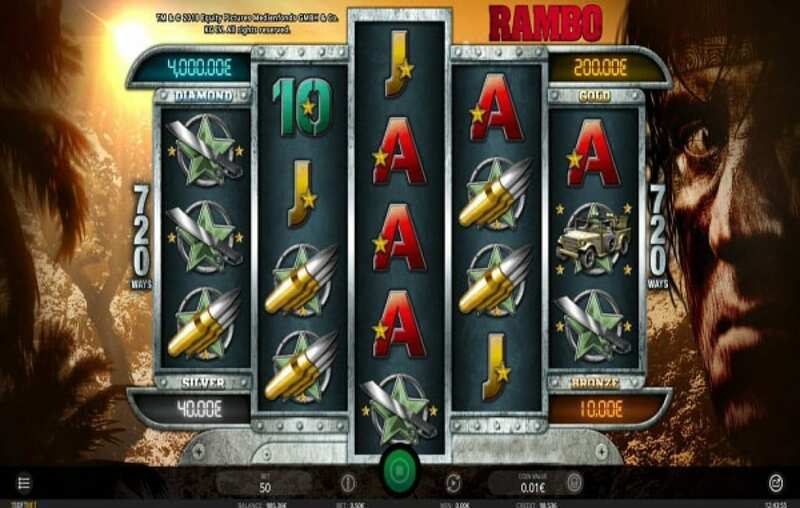 iSoftBet pays homage to one of the great action films of all time, Rambo, by creating this slot machine. The online game revolves around the action movie that starred Sylvester Stallone. It is a movie franchise that included several sequels including Rambo First Blood, First Blood Part II, Rambo III, Rambo and Rambo V which has a release date in 2019. The movie franchise revolves around the 1972 novel by David Morrell that was about John Rambo, the troubled Vietnam Army Veteran. He was a specialized and skilled fighter who knows all about guerrilla warfare, weaponry, survival and hand-to-hand combat. The movies were full of action, bullets, explosions and more. 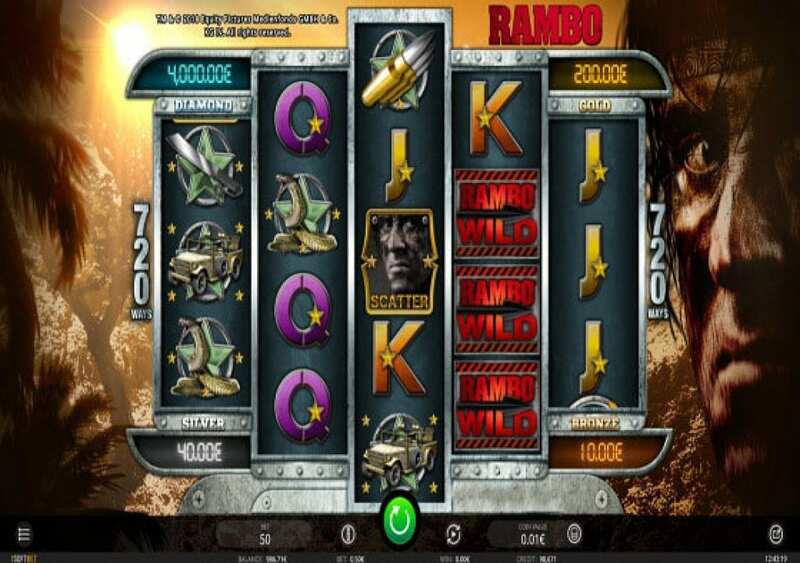 Therefore, you will get to enjoy an explosive experience through the slot machine as you join Rambo in his adventure and quests in the Vietnam jungle. You will also get to earn plenty of rewards and fortunes along the way as you help Rambo through the reel and the 720 ways to win that this iSoftBet slot has to offer. Rambo is a five reel slot machine that has 720 ways to win. The number of symbols on each reel different from one Reel to another as it has the 3-4-5-4-3 format. These reels take place on a Vietnamese jungle backdrop with Rambo on the right side of the Reels as he joins you throughout the gameplay. The visuals of the slot are realistic and will help create an immersive ride. 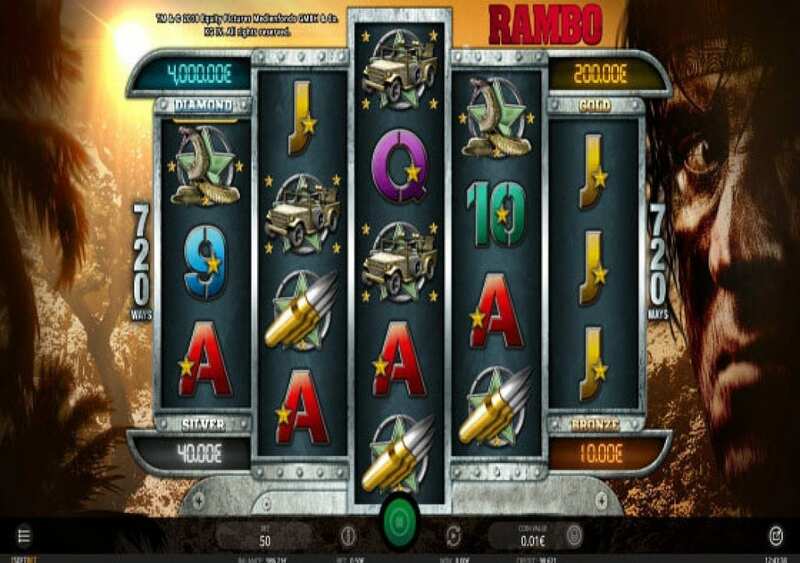 The symbols that will appear on the slot’s reels include the army Humvee, bullets, Rambo, the Rambo Logo, grenades, machetes, snakes, explosives and the poker card symbols. The control panel is underneath the reels, and it is where you will control the gameplay, spin the reels, place bets and more. Rambo by iSoftBet offers you a good RTP of 97.02%. You can earn a reward when you get three matching symbols on adjacent reels, starting from the left. There are also different progressive jackpots that you can trigger along the way with the help of the golden grenade, in addition to free spins, wilds and expanding symbols. All of this is going to result in a highly-rewarding slot experience. 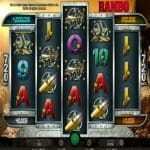 Rambo is an iSoftBet slot machine, and this is why you can expect to find plenty of bonuses, features, and jackpot prizes. 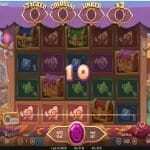 The online slot machine comes with a wild icon, free spins, Scatter icons and progressive jackpots that you can trigger during the gameplay. 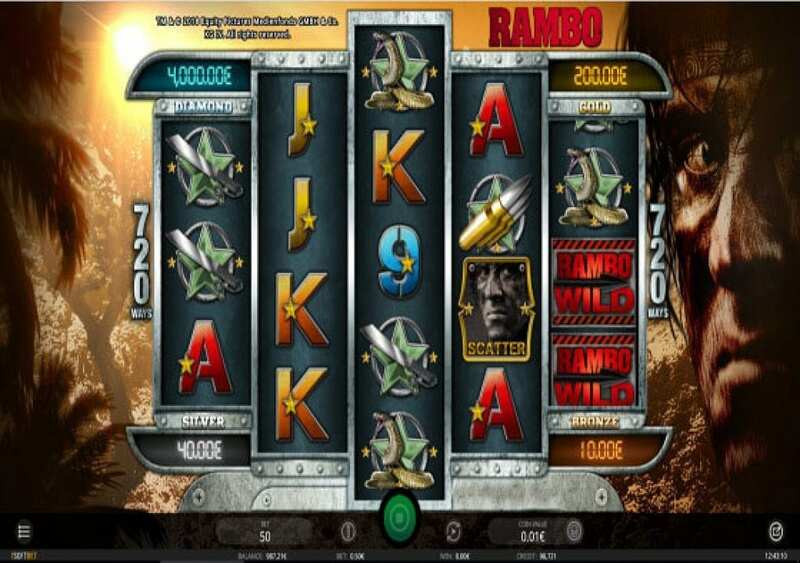 The Rambo Logo of the slot is the wild icon that can help you trigger line prizes by substituting for all other symbols on the reels. 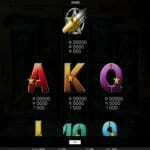 It is not going to substitute for the Scatter icon of the video slot and the Golden Grenade jackpot. So whenever you see the logo, you know that you have better chances at forming a winning combo on the slot machine’s ways to win. 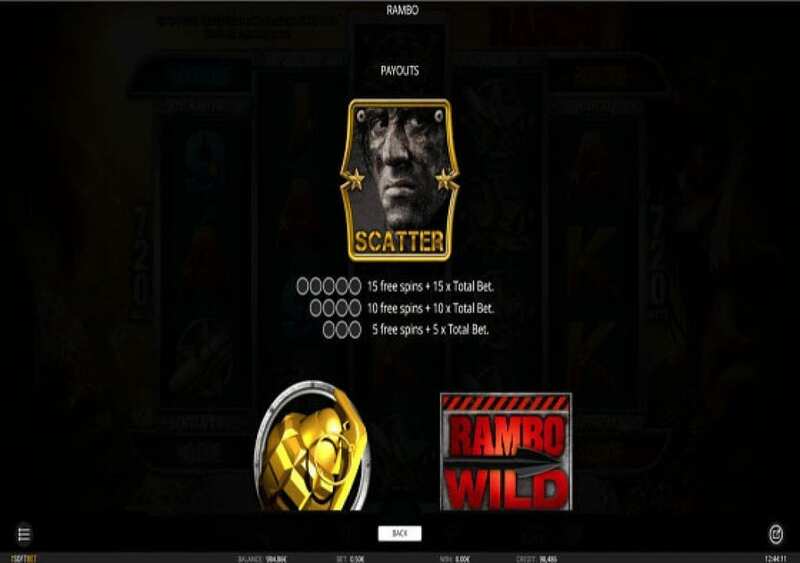 Sylvester Stallone’s Rambo is the Scatter icon of the slot. The first thing Rambo can do for you is trigger Scatter rewards that are a multiple of the stake. If you get three, four or five Rambo symbols, you will earn an award of 5x, 10x and 15x the stake respectively. That is not all as Rambo will also trigger the free spins round of the slot. You will earn five, ten or fifteen when you get three, four or five Rambo symbols respectively. Before you start playing the free spins, the slot will pick one symbol at random that will become an expanding symbol for the duration of the free spins round, so whenever it lands, it is going to expand to cover the entire reel. You can also earn additional free spins when you get more Scatter Rambo symbols during the free spins, and they will also have the same expanding symbol. It is the last unique symbol that you should keep an eye out for during the gameplay as it is the key to trigger the explosive progressive jackpot feature. You will need to get five of these grenades to trigger them. Five will trigger the low-value Stealth Jackpot, six Golden Grenades will trigger the Bravery Jackpot, seven Grenades will trigger the Honor Jackpot, and nine grenades will help you scoop the highest jackpot, the Explosive Jackpot. You can trigger these jackpots during the base gameplay and the free spin as well.